Are you looking for a way to cool a specific area of your home — but not the entire house? Do you have a home where there’s no existing ductwork or where running traditional air ducts is not feasible? If so, a ductless air conditioning system or ductless heat pump system may provide the ideal heating and cooling solution for your home. Tuckey Mechanical Services, Inc. will design and install a ductless heat pump split system or a ductless air conditioning system for homeowners in Harrisburg, PA, Carlisle, PA and the surrounding areas. Tuckey Mechanical Services is part of the Tuckey family of companies that has been providing premium contracting services to South Central PA home and business owners since 1968. What Is a Ductless Air Conditioning or Heat Pump System? 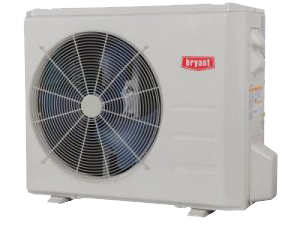 Ductless mini split air conditioners typically consist of two components: a relatively small, wall-mounted indoor A/C unit, which is connected to an outside compressor via piping. 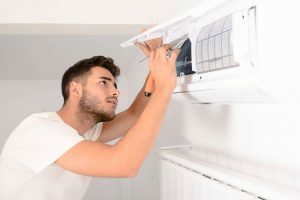 Ductless air conditioners provide a quieter, less conspicuous alternative to window air conditioners, and they’ll give you increased placement flexibility since you don’t have to put them in a window. You only need to draw a small hole in the wall to run the piping between the wall unit and the compressor. In addition to ductless air conditioners — which are for cooling only — you can also opt for a ductless heat pump, which provides both cooling and heating. When Should You Consider Installing a Ductless Air Conditioning or Heat Pump System? Ductless air conditioners and heat pumps can work well in situations where “spot cooling” or “spot heating” is required. One example is building an addition such as an extra bedroom, garage apartment or sunroom. You can also use these systems to create separate temperature zones within a home — for instance, you can heat the room you’re in, but you don’t need to worry about the room that’s not occupied. They’ll also provide a solution for your home’s “problem areas” that are difficult to cool with a traditional A/C system. In many cases, a ductless system offers a less expensive alternative to installing ductwork in an existing home. 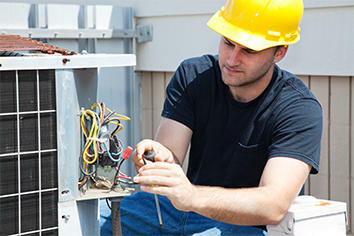 Ductless mini split air conditioners or heat pumps aren’t right for every heating and cooling situation. They don’t work well for maintaining a consistent temperature throughout a larger, multi-room home — generally, their best use is targeted toward individual rooms or living spaces. Although they’re relatively unobtrusive, there could be instances where the wall-mounted units could detract from the decor of a room. This is largely dependent upon your home’s existing layout and design considerations. We’re here to help you figure out your best options! When you reach out to us, we’ll help you decide if a ductless heat pump split system or ductless air conditioning system is right for your Harrisburg, PA, or Carlisle, PA-area home. With our decades of home cooling expertise, Tuckey Mechanical Services can help you determine if a ductless system is a wise choice for your home. Contact us to explore your options today. If you choose to “go ductless,” we can also provide a fast, quality installation.